Indian Air force Has Published a Notification For The Recruitment Of AFCAT (01/2019) Indian Air Force invites Indian citizens (Men and Women) to be part of this elite force as Group A Gazetted Officers in Flying and Ground Duty (Technical and Non-Technical) branches. Online examination will be conducted on 16 Feb 19 and 17 Feb 19 for AFCAT exam.Brief information about Indian Air force AFCAT Recruitment mention below. 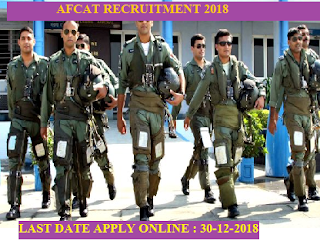 How to Apply AFCAT 2018 : Aspirants for IAF are required to apply online by using the link https://careerindianairforce.cdac.in, or https://afcat.cdac.in. Aadhaar Card is mandatory for online registration. For more Details about AFCAT RECRUITMENT 2018 candidates should visit official website of IAF & check official notification before apply.